One of the best parts of being in the travel and tourism industry is getting introduced to great travel writers and photographers. We’ve been inspired by many, and recently were lucky enough to run across Katherine and Romeo Belarmino’s travel blog, Travel the World. One of the posts that hit home with us was this one on traveling with their dogs. The Belarminos were kind enough to allow us to share part of it with you and add our own tips for those of you bringing Fido or Fancy to Bishop. For some of us, our pets are like our family and we don’t like to be separated from them for too long. When we travel, the only thing that really makes us want to come home is being able to see our two tiny dogs again. So, while we don’t always travel with our pets, we are always looking for travel opportunities like weekend getaways where we can bring our dogs along. However, traveling with pets is no walk in the park. Go here for our 10 tips for traveling with dogs to make your pet-friendly vacations as stress-free and enjoyable as possible. 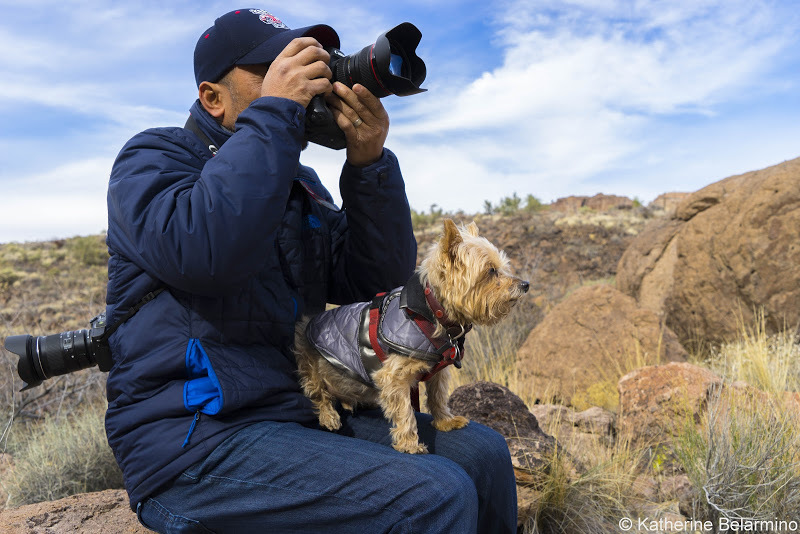 Traveling with your canine best friend can be super rewarding, and all the outdoor spaces around Bishop make it an ideal place to bring your dog. As you’re planning your trip to Bishop, we want you to have all the information you need for keeping your pet happy and healthy throughout your journey. Visit our Dog-Friendly City page, designed just for those of you traveling with your pets. You might also visit the Bishop Dog Park and City of Bishop Recreation pages for more information on the dog park. Remember, summers in the Owens Valley can be very hot, and winters very chilly. Planning a vacation with your dog means factoring in canine comfort – whether it be a shady campsite near water, or a cozy hotel room with heat. We’ve got both here, and you can find pet-friendly hotels using sites like dogfriendly.com and bringfido.com. Be sure to call ahead to check for specifics when booking your rooms. Most USFS and BLM campsites in the eastern Sierra are dog-friendly, but National Parks are a little stricter. Check on pet rules when reserving your campsites and make sure you bring a sturdy leash and plenty of bags for picking up and disposing of your doggie’s doo. Most restaurants are prohibited from allowing dogs inside, but many of Bishop’s coffee shops and eateries have dog-friendly outside patios, where both you and your pet can enjoy a break from activities, or fuel up for the day. We have a short list here, but a call ahead to the establishment never hurts. Bishop and Mammoth host several pet supply and grooming businesses, and most likely you can find just what you need for Fido right here in town, including excellent veterinary care (which we hope you don’t need!). We’ve got links to other useful services for pets on our website, Bishop Visitor Information. Public transportation in the eastern Sierra is easy and inexpensive. Dogs are allowed on the Eastern Sierra Transit Authority buses if muzzled or crated. Check the ESTA website for times, rates, and routes. We love seeing our visitors enjoying the eastern Sierra with their dogs, and hope that you’ll share your photos with us over on our Facebook page, Visit Bishop or tag us on Instagram using @visitbishop. See you at the dog park!